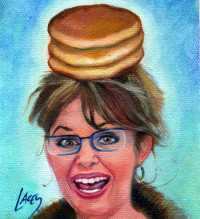 Home › Blog › Sarah Palin's Yahoo Email Hacker Could Get 50 Years?? Sarah Palin's Yahoo Email Hacker will stand trial. David Kernell, a 22-year-old student at University of Tennessee will stand trial on four felony charges related to his “hacking” of Ex-Governor Sarah Palin’s e-mail. If he is convicted of the four charges (which include identity theft, wire fraud and obstructing an FBI investigation), he could receive up to a 50 year sentence. That’s FIFTY. Five Zero. He would be over 70 years old when released. Now, of course I have to preface this post by saying, there’s no feasible way he would actually receive 50 years. That’s the just the max on all charges. I’m sure the DA will use this number as a threat to force him into a plea bargain and avoid the inevitable legal mess. Is a 50-year sentence even remotely justifiable? Did Kernell’s actions deserve charges for such “big name” charges like “identity theft” and “wire fraud”? Did Kernell’s actions deserve ANY charges at all? The story of events goes like this. Gov. Palin used her Yahoo! (public) e-mail account in compliment to her official “.gov” e-mail account and engaged in certain conversations containing information relating to government matters in addition to everyday personal communication on both accounts. After Kernell discovered her Yahoo! username, he used Yahoo!’s “Forgot Your Password” feature, made guesses at the answers to her security questions and from there was able to access her account. He then took multiple screenshots and posted the contents of her inbox publicly online under the moniker “RUBICO”. All of this occurred while Sarah Palin was the Republican candidate for Vice President. There is no doubt what Kernell did was stupid. Perhaps he thought he would have total anonymity because he never released his real name. (Unfortunately for him, the U.S. government has got some real smart people to track down cyber-criminals.) Maybe he was simply ignorant to the laws and didn’t know what he was doing was a punishable offense. Maybe he was doing it for the lulz. But, one could make the argument that the one to blame here is Sarah Palin for using a public service like Yahoo! at all. Common sense would lead to the fact that her public status makes her a target for hackers. With that said though, I believe that Kernell should definitely be punished for his actions. While I believe his intentions were not completely malicious (to my knowledge, he wasn’t planning on selling Palin’s secrets to the Chinese or anything), he still intentionally broke into somebody’s private account and then posted the private contents on the Internet. If it had happened to me, I would want this kid’s head to roll! Well, his head may yet roll. According to reports, Sarah Palin is set to take the stand to testify in the case. The hearing will take place in Kernell’s home state of Tennessee. Tennessee is traditionally known as a GOP “red” state where the public favor for Palin may be higher than in other states. Yahoo! News reports that vice chairwoman of the Knox County GOP states that "People are excited that she is coming because she is very well thought of… the rank-and-file of the party will probably come just to get a chance to speak to her and shake hands." Can David Kernell get a fair trial under those circumstances or will the Tennessee jury make an example of him to ensure others don’t follow his actions? Will he be able to walk away or will he get "drilled baby, drilled"? What do you think?